May has come and gone, and the weather is warming. But is that due to the Earth’s orbit around the sun, or is it due to the amount of energy being expelled by Millions writers hard at work at the upcoming Great Second-Half 2015 Book Preview, which will hit these pages in about a month? My guess is the latter, but in the mean time, grab a drink and stay cool. This is a 500-page novel about a war increasingly few Americans are old enough to remember, in which not one of the principal characters is American. This is a recipe for a well-regarded literary novel, perhaps even a prize-winning critical darling. But a breakout bestseller so popular it leaves Amazon’s vast warehouses empty of copies at Christmas? Not likely. So what then explains the success of All the Light We Cannot See? It all, I would argue, comes down to Doerr’s sentences, in particular his masterly use of nouns and verbs. 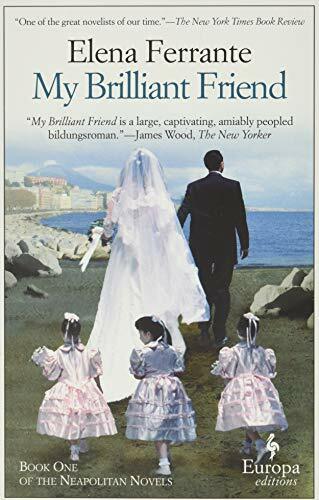 Meanwhile, Elena Ferrante continues her reign atop our Top Ten list, and My Brilliant Friend looks poised to join our Hall of Fame in June. More than likely, it’ll be accompanied by The Strange Library and Dept. of Speculation. McCarthy’s fourth novel introduces us to a “corporate anthropologist” struggling to wrest an overarching account of contemporary existence from a miasma of distraction and dream. Perhaps he’s a stand-in for your average internet user. Or novelist. At any rate, expect ideas and delight in equal measure (assuming there’s a distinction); McCarthy’s reputation as a “standard bearer of the avant-garde” underrates how thoroughly he’s mastered the novelistic conventions he’s concerned to interrogate – and how fun he is to read. Certainly sounds appealing. Join us next month, but remember: with the Great Second-Half Preview on the horizon, it’ll be a good idea to keep some space open on your “to be read” pile until that’s posted. Near Misses: The Familiar, Volume 1: One Rainy Day in May, The Paying Guests, Everything I Never Told You: A Novel, To Rise Again at a Decent Hour, and My Struggle: Book 1. See Also: Last month’s list. We spend plenty of time here on The Millions telling all of you what we’ve been reading, but we are also quite interested in hearing about what you’ve been reading. By looking at our Amazon stats, we can see what books Millions readers have been buying, and we decided it would be fun to use those stats to find out what books have been most popular with our readers in recent months. Below you’ll find our Millions Top Ten list for May, and we update the list in our sidebar each month.ThisMonthLastMonth TitleOn List1.1.Sister Bernadette’s Barking Dog: The Quirky History and Lost Art of Diagramming Sentences4 months2.2.26665 months3.3.The Rejection Collection: Cartoons You Never Saw, and Never Will See, in The New Yorker3 months4.5.Olive Kitteridge4 months5.6.The Dud Avocado5 months6.4.Celine Dion’s Let’s Talk About Love: A Journey to the End of Taste3 months7.–Infinite Jest3 months8.7.Knockemstiff3 months9.–Felonious Jazz1 month10.–The Brief Wondrous Life of Oscar Wao3 monthsWe had one new arrival on our list for May and two titles that returned. Readers were curious enough to try out Bryan Gilmer’s Felonious Jazz after he wrote about his experiments with pricing the ebook version of the novel. Returning to our list after a one month hiatus are two classics of contemporary literature, Infinite Jest and The Brief Wondrous Live of Oscar Wao. Departing from our list are Everything Ravaged, Everything Burned, The Lazarus Project, A Supposedly Fun Thing I’ll Never Do Again, and The Savage Detectives.Also notable is the continued strength of Olive Kitteridge, which appears to have many fans among Millions readers. If you’ve been reading any of the books mentioned above, we’d love to hear about it in the comments.See also: Last month’s list. “The past is never dead,” wrote William Faulkner, who may have been unconsciously foreseeing Tessa Hadley’s novel, and its six-month run on our site’s Top Ten. While at times the book seemed likely to drop from our rankings – it began in tenth position and only once cracked the top three – it was nevertheless a gritty and determined run, now punctuated by its ascendance to our Hall of Fame. Most of the other titles on our list bumped up a spot to fill The Past‘s void, and a solitary newcomer emerged this August in our ninth spot. There, Paul Beatty’s satirical novel, The Sellout, joins our list for the first time. Beatty’s voice is as appealing, erudite, and entertaining as any since Alexander Portnoy’s. … It is a lacerating, learned, witty, and vulgar voice — definitely not pejorative-free — brash and vulnerable and self-righteous in its jeremiad against self-righteousness of any kind. This month’s near misses included: Signs Preceding the End of the World, Heroes of the Frontier, The Queen of the Night, Homegoing and The Underground Railroad. See Also: Last month’s list. Here’s hoping his next effort — due before the end of the year — is stronger, although it seems like no matter what, it’ll sell plenty of copies. Imagine a brilliant work of science fiction that wins the National Book Award and is written by a contender for the Nobel Prize in literature. Imagine that it is filled with dazzling leaps of the imagination, stylish prose, unique characters, philosophical insights, and unexpected twists and turns, but also draws on scientific concepts at every juncture. Imagine that it ranks among the finest works in the sci-fi genre. And then imagine that almost no science fiction fan has read it, or even heard about it. Rounding out this month’s list, we see the continued dominance of Rachel Cantor’s A Highly Unlikely Scenario and Jess Walter’s Beautiful Ruins. Both Well-Read Women and The Son remain popular mainstays as well. The list is due for a major shake-up in two months, as all four will likely be gracing our Hall of Fame by October and November. Will Knausgaard hang on to the last spot of the list by then? Will it have moved up? Will Book 2 have cracked the rankings? Only time will tell. Near Misses: Americanah, Jesus’ Son, Bark, and Just Kids. See Also: Last month’s list. In ninth position is Ian McGuire’s The North Water, which was longlisted for the Man Booker Prize and named by the New York Times‘s editors as one of the Ten Best Books of the Year. The novel is a thriller set on a nineteenth-century Arctic whaling ship with a killer aboard, which sounds to this Top Ten writer like a very distinct flavor of Hell. The real mover in July was Annie Proulx's Barkskins, which climbed three spots from tenth to seventh, a rise no doubt attributable to Claire Cameron's strong endorsement in her "Summer Reading List for Wretched Assholes Who Prefer to Wallow in Someone Else’s Misery." To start the new year, we’ve made some minor changes to how we calculate our list. Basically, we’ve added a slight penalty for lower-priced books because we were finding that spikes in sales of cheaper short-format books (e.g. "Kindle Singles") and aggressive promotional pricing of ebooks was skewing the list a bit. The change had no dramatic impact on the December list other than that it knocked George Saunders’s $0.99 short story Fox 8 out of our top 10. The rest of the big changes were driven by our 2013 Year in Reading. Some books that were already popular with our readers got a lot of love in the series, including Donna Tartt’s The Goldfinch which surged into the top spot after three contributors named the book as a favorite read of 2013. Meg Wolitzer’s The Interestings was also a popular name in the series, and that helped return the book to the Top Ten after a few months off the list. Rachel Kushner was the runaway favorite in our series for The Flamethrowers, though the book dropped a spot to number three. Our lone debut is a very unusual title. Draw It with Your Eyes Closed: The Art of the Art Assignment is a slim collection, the result of several art teachers being asked to contribute the best art assignments they’ve ever heard of. Hannah Gersen included the book in her list of offbeat gifts for writers last month. Finally, the contentious Taipei by Tao Lin graduates to our Hall of Fame. The book was the subject of a famously negative review here that perhaps not so paradoxically seemed to get a lot of people interested in the book. Near Misses: The Circle, Night Film, Eleanor & Park, The Unwinding: An Inner History of the New America, and MaddAddam. See Also: Last month’s list. During the month of December, The Millions was flooded with book recommendations thanks to our Year in Reading series. Many of these recommendations piqued the interest of our readers, and a pair of hidden gems were intriguing enough to make it into our Top Ten. One was Anthony Doerr’s effusive praise for Judith Schalansky’s Atlas of Remote Islands, and the other was Sam Lipsyte’s unearthing of the late and little known Hob Broun and his Gordon Lish-edited book Cardinal Numbers. A third debut in December was Laura Hillenbrand’s Unbroken, her hotly anticipated follow up to Seabiscuit that was noted with an “AAAH!” in December by Sam Anderson.